There is really no sense to "buttering up" this review. Thanks to Dennis over at "Convergent Technology", I have had a chance to take a look at the i-mate PDA2k. The device is a PDA, a phone, and a camera, all rolled into one, making it one extremely powerful device. 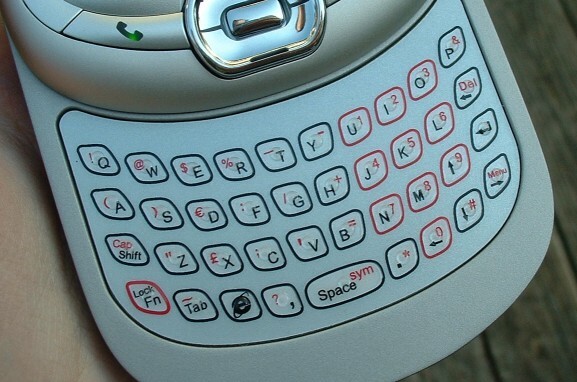 It also includes one of the hottest new ideas on the market, a slide out thumb keyboard. But that is just the beginning of included features, and the PDA2k does not leave much to be desired. It is a pinnacle of style, power, and functionality all rolled into one device. The i-mate PDA2k is based around the Intel XScale PXA263 processor running at 400 MHz and Windows Mobile 2003 Second Edition for Pocket PC Phone Edition. The PDA2k has 128 MB of RAM, and has a 64 MB ROM. For expansion, an SDIO slot is included at the top of the device. When it comes to wireless, this device has it all. WiFi (802.11b), Bluetooth, and GSM/GPRS wireless are all embedded in the device. Being that it is a Phone Edition device, the GSM/GPRS module is both for voice and data service. The screen is 16-bit color with a max resolution of 240x320 (no VGA support), and has a surprisingly vibrant screen. Under the screen is a thumb keyboard and on the back of the unit is a VGA camera. 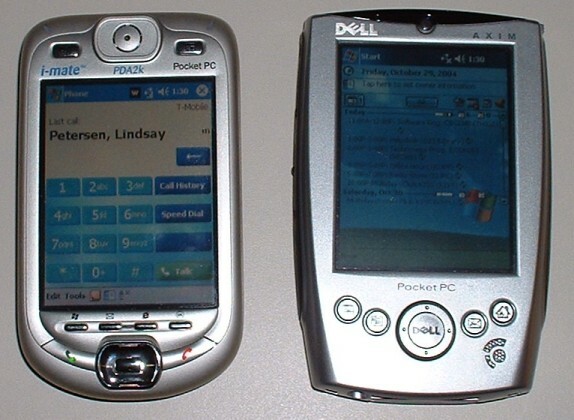 The PDA2k has the same general form of many Phone Edition devices...or at first glance I think it does. The speaker/earpiece is a distinctive feature on the top of the front face. It is also immediately noticeable the number of buttons on the front. The device has a slightly different hue to it than other devices, a little darker silver. The top of the device has the on/off button, SD slot and the headphone/headset jack. The right side of the device is smooth while the left side of the device has two more buttons, up down control (which I don't think works particularly easily) and the IrDA port. The bottom of the device has the soft reset button, sync port (which can also be used for power, but there is no AC adapter port), and the microphone (which is not in a good location for phone calls nor for recoding voices in a room). The back of the device has the camera as well as the removable battery that is latched by a small easy to open latch on the bottom back of the device. Under the battery is the SIM card holder. For all the features, the device is relatively light and also thin (only 0.74" thick). One worry about the size and weight was if the device was weighted correctly for controlled use of the keyboard, but the top of the device, when open, does not change the weight distribution to much. Unlike most Pocket PC devices that only have four programmable buttons, the PDA2k has nine. Two buttons at the top of the front face, four at the bottom, an action button in the middle of the directional pad, two buttons on the left side of the device, and finally a programmable button on the keyboard. This doesn't include the two buttons that are for phone pickup and hang-up. Having more buttons gives you more options for how to control your device. For instance, you can do one handed operation for quite a number of functions. It is also nice to be able to map additional functions as it is likely you will have more than four programs you use often with the device, or, if nothing else, you can program the start menu to one (which is actually done by default) and ok/close to another. The buttons can be locked so only the on/off button will work when the device is turned off (this is the mode I prefer for this device). I also like having the contact and address buttons at the top of the front face, and since they are larger it makes them easier to press. Finally, the directional pad is a great size and form. It is really easy to press and direct, which is very good. There is a lot to say when it comes to wireless on this device because after all, it has all available types of wireless embedded in it. We'll start the the short range and move up. Bluetooth is becoming a must have for a lot of people, though I have been slow to adopt it in my general use. Bluetooth is quick an easy to enable with the included Wireless Manager software and you can always tell when Bluetooth is on because of the left light which will flash blue. The big reason for why Bluetooth is a good idea on this device is because the device is a phone and new Bluetooth headsets are a great addition to using the device as a phone. Because of the size and weight of the device, many users may prefer a headset, and while you can plug in a wired headset, going wireless allows you quite a bit more leeway. Note, there has been some discussion on forums related to the PDA2k about Bluetooth stack problems. While I did some testing, I did not elusively test the Bluetooth due to time constrains. Some users have reported problems while others have reported everything checks out. Next on the list is WiFi. The embedded WiFi is 802.11b based. I often use WiFi in my daily life and love having it embedded in the device instead of having to use a card. Again, WiFi can be enabled from the Wireless Manager and flashes the left light green when it is on. With WiFi, there is always some onboard application for connection information. Most users likely won't use this because Windows Mobile will take care of the connection and basic configuration, prompting you if a key is needed. The application included is scaled down (which may not be appreciated by the general user) and adds an additional area for confusion when configuring wireless since parts are still done through the Windows Mobile interface. You can specify if you want better performance or the best possible battery life. You can also have WiFi turn itself off if it gets disconnected for to long. Last but not least is GSM/GPRS (quad-band 850/900/1800/1900). 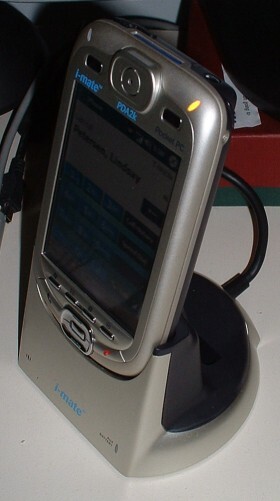 Cellular data service is the final option for connecting the PDA2k. While it is often slower than other options (specifically compared to WiFi), it is an extremely available option as cellular networks are much more available than open WiFi networks. Data service is great for downloading mail headers and checking news feeds. With the PDA2k I don't have to sync news stories before I leave for class, or in the library before class starts (over WiFi), but can do it whenever I want to see what is new. On the cell phone side for things, I have noticed the radio in the PDA2k is relatively strong compared to my phones and others those around me use as I was often able to get service where others phones may not be able to. One of the best parts about having both WiFi and GSM/GPRS is that the device can jump between networks. (This works well in an environment where there you are not crossing into a lot of WiFi networks you don't have access to.) When WiFi is available, the PDA2k can move seamlessly from the data network to the WiFi network. 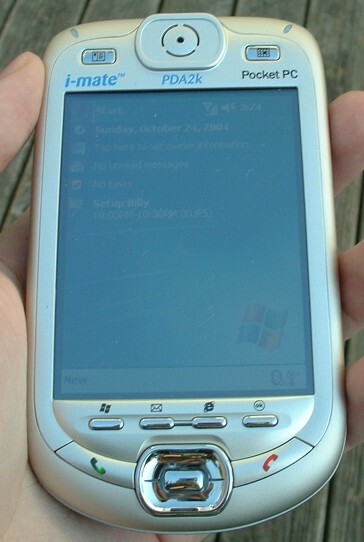 When a connection is lost to the WiFi network, the PDA2k can move right back to the data network. T-Mobile is now provides unlimited access on their data network, so this isn't cool because it can save you money, but it is cool because the WiFi network is likely to be much faster than the data network. A place where this came in handy was on campus at school where there is only a couple WiFi points spread across campus. I don't really know why you would need an SD slot on this device other than for memory. In any case, a SDIO slot has been included so in case there isn't something embedded you want, you can use that. Primarily SDIO would be used for Bluetooth or WiFi, but the PDA2k already has that. A camera would be another option, though the device has that as well. Recently a SDIO GPS card has been released, so that would be a good option, though because of the style of the device, using a card like the SDIO GPS presents a problem. Because of the large antenna on the SDIO card, you can't slide open the device to reveal the keyboard. 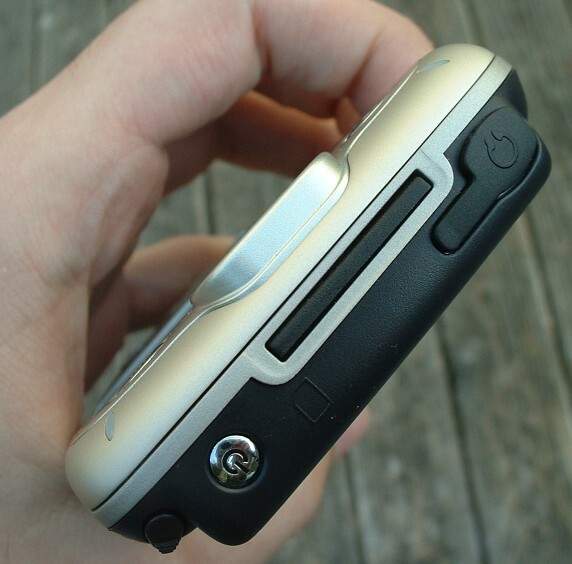 The SD slot is on the back half of the device, and the front half slides up (or the back slides down). For users that think they may be using a GPS SDIO card with the device or a future type of SD card that wouldn't fit completely in the device, this would be a drawback to the device. I believe that any PDA user would be more than satisfied with the screen on this device. While it does not support the VGA resolution option with Windows Mobile 2003 Second Edition, the screen is extremely vibrant. Normally I run my devices at full or near full brightness. One sign to me of a good device is when I can run it at half brightness or less. With the PDA2k, I am running it at only 30%, and it is still a strong brightness. Full brightness is actually extremely bright and I don't even like to use it on external power, so I think that speaks well for the screen. Because the device is a Phone Edition, I have to complain about my face touching the screen when using it. Now, on screen buttons don't get pressed, but usually the screen will get smudged after using it. I am not using a screen protector and think that something like a Clear Touch screen protector would help, but still it would have been nice to see some kind of special screen coating to prevent smudging. I do however like that the screen will turn off while you are on the phone, and you can of course leave the screen off and the phone will still ring if there is an incoming call. For most of the functions of this device I have a lot to say, but the cradle is just a cradle and the battery works. The cradle really isn't anything special. It is pretty standard, and rather large for my taste. You can plug in the AC power adapter if you chose and/or a second battery if needed. The battery in the device can defiantly hold its own. A 1400 mAh battery is pretty good, though this device has a lot of things that require power, especially if you are using it as a phone and it is constantly connected to the cell network waiting for calls. The specifications say this equates to 3-4 hours or talk time, 15 hours of PDA time, and 168 hours of standby time. After using it, I would say this is likely accurate. After using the device for a full day, with phone functionality on always, WiFi most of the time, and taking about 45 minutes of calls, I still had 65% of the battery left. On the back side of the PDA2k is a VGA camera. To use it, all you have to do is press the camera button once to get the live feed on screen and a second time to capture a still image. One interesting thing to note is when using the camera, the devices screen will turn up to full brightness, likely so you can see the live camera feed well. The camera is good for quick snapshots, but that is about it. It is neat to have, but I don't know that it has much practical use. The keyboard however has tons of practical use. In fact, I use it all the time. I like it better than using stylus input for writing. While you can't type on it like a regular keyboard, I still have good luck using my thumbs. When you begin using the keyboard it becomes backlit, which is good for highlighting the keys. Unlike other thumb keyboards, the buttons on this keyboard are slightly different, and I don't like them as much. They are relatively flush against the device (likely because of the slider mechanism), and the actual button is not the full area that is drawn. I have big hands, so I like keys to be of substantial size and easy to press. After using it for a while I have gotten the hang of how to use it best, but I don't prefer the style of keys. I am a big fan of the PDA2k's speaker. The speaker doubles as the ear piece for voice calls and is extremely strong. It is very easy to hear calls and get the caller good and loud. To test the device, I used it to make all my calls. I noticed a number of people had trouble hearing me. At first I just discounted it as either standard cell phone issues or that I was mumbling. Then my girlfriend noted it, and when I said I thought it was one of the two things I just mentioned, she said she just didn't think it sounded as clear as other phones. The problem could be the placement of the microphone, which looks like it is on the bottom (not back, but bottom by the sync port). Since one of the primary functions of this device is as a phone, I do feel that this should have been worked out so the device would provide a clear signal for the caller. This is the longest review I have written. Then again, this is likely the most powerful and featured packed device I have ever looked at...and the price reflects that. The PDA2k is a power house of function and likely the user that is going to fully use a device like this would be the business user or the tech user. The device requires someone that wants to be always connected, needs access to the internet and email, always has a phone with them, and wants a device that won't let them down when they need it most. A number of users (including me) noticed some issues with the phones microphone, and poor voice pickup for calls. The biggest drawback of this device is likely its price, which is at just over $900. While for the price you get an unlocked device that can run on any GSM/GPRS network, it is a hefty price tag for the user that won't use the device to its full potential. 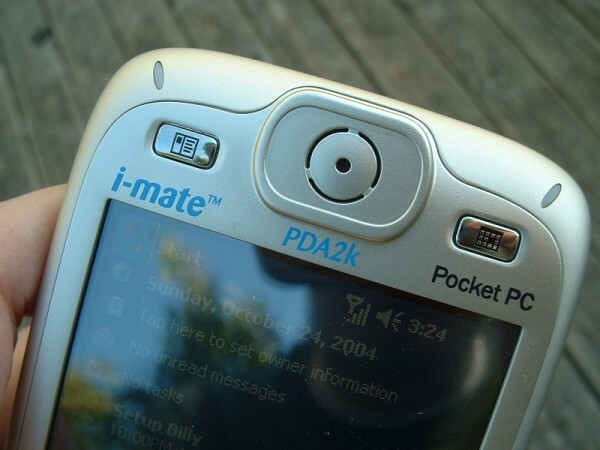 But if you have the money, want power, and need connectivity, the i-mate PDA2k could be right device for you. http://www.prweb.com/releases/2016/08/prweb13621202.htm . Best waist trainer . Definitions of Boris Lozhkin www.savingadvice.com.